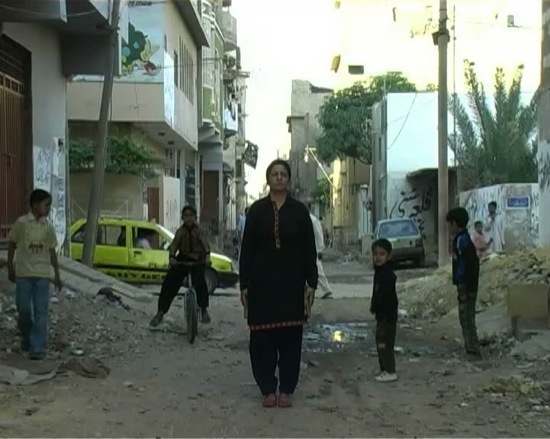 To accompany The Unreliable Narrator by Karen Mirza and Brad Butler, waterside contemporary is pleased to present The Exception and the Rule, a film work produced by the artists in Karachi at the time of the Mumbai attacks. The Exception and the Rule employs a variety of strategies in negotiating consciously political themes. Avoiding traditional documentary modes, the film frames everyday activities within a period of civil unrest, incorporating performances to camera, public interventions and observation. Every morning in Karachi we read the local newspapers. This became a pattern. The front pages of the International and Local news told us how our day might go. In these troubled times news headlines had direct impact on our sense of freedom around the city. The distance we were prepared to go from home. Most articles were lucid, intelligent, balanced and current, but as the days and opinion cycled past so our interest in these articles waned. After all, even a cursory look at a map would raise an eyebrow as to the complexity of Pakistan’s neighbours. This is a country where so many [geo-]political points converge that their tides are directly played out in people’s everyday. The pace of daily change piled thoughts on top of one another. When we put this to a learned friend active in Pakistan he laughed and told us that To understand Pakistan you must first understand that you cannot rationalise the non rational.